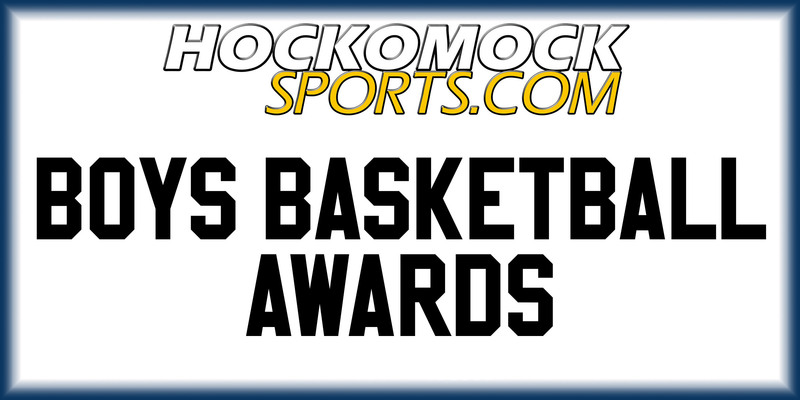 Below are the official 2019 Hockomock League Boys Basketball All Stars, selected by the coaches in the league. TAUNTON, Mass. – The Taunton Tigers were on the verge of a big upset. With just over two minutes to go in a tied game, Taunton senior Wesner Charles found an open lane for an easy layup to give the 14th-seeded Tigers a 58-56 lead. And on Mansfield’s ensuing trip up, Charles came up with a block that gave the Tigers the ball back and all of the momentum in front of a packed crowd inside the Rabouin Field House. But the Tigers couldn’t slam the door shut on the second-seeded Hornets, as a potential dagger three rimmed out. And there aren’t many teams better at making you pay than the Hornets. Senior Tommy Dooling (19 points) launched a corner three that bounced twice off the rim before falling, putting the Hornets up by one with 1:34 to go. Taunton couldn’t answer as a three-point shot was off the mark, and Mansfield sophomore TJ Guy (career-high 19 points, eight rebounds) concerted off his own miss with 44.5 seconds left to put Mansfield up 61-58. The Hornets got the stop they needed, Guy broke free for another layup and Mansfield came out with a hard-fought 65-59 win over a gritty Tigers team. With the win, the Hornets advance to their third straight Division 1 South Sectional Final, and seventh appearance in the last 10 years in the game. 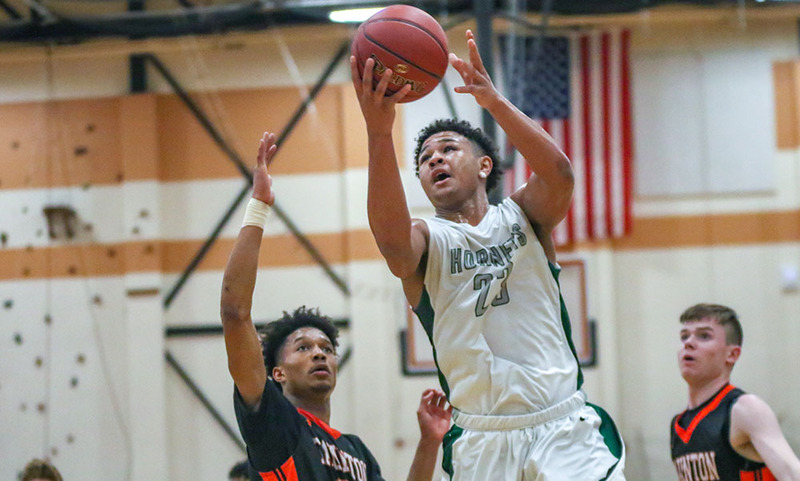 “When the wheels started falling off, with this atmosphere, I was a little nervous with how some of our young guys, guys that haven’t been here before, were going to respond,” said Mansfield head coach Mike Vaughan. “We looked panicked there for a little bit. But I reminded them ‘Don’t get too high, don’t get too low, come out and do what we do’ and we needed a couple of possessions of basket, stop, basket, stop, and we were able to do that. It was a close game throughout as the Hornets had a brief eight-point advantage in the first half, and led by only seven at one point early in the second half. Taunton had an early 11-8 advantage but didn’t take another lead until midway through the fourth quarter. A three-pointer from Sam Stevens that came off an offensive rebound had the Hornets up 51-48 entering the fourth quarter. Free throws from Taunton senior John Martins (14 points) got the Tigers within two but Damani Scott answered with a strong take for the Hornets. A free throw from Lou Vendrell followed by a steal and bucket from Naz Kenion (career-high 20 points) knotted the score at 53-53. Kenion continued his stellar play with a nice move baseline to give the Tigers a 55-54 lead, their first advantage of the second half. Kenion came up with a steal to get Taunton the ball back, but the Tigers missed a three. A free throw from Kenion extended the lead to 56-54, and Charles knocked away a pass to get the Tigers another chance to extend the lead, but Taunton’s layup was off the mark. Mansfield tied the game on the other end as sophomore Matt Boen had a layup off a feed from Drew Rooney. “I thought we played great defense. It felt like we took them off the three-point line for the most part, which is a lot of their offense, But as usual, they adjust and they didn’t panic. If you’re not composed for 32 minutes, you make a mistake, they take advantage of it, that’s Mansfield. The two teams battled back-and-forth in the opening quarter with Taunton jumping ahead 11-8 behind a three-pointer from Dante Law (nine point, seven rebounds) but Dooling had a pair of triples and Guy added six points to help the Hornets take a 17-14 lead after one. Mansfield extended its lead to 22-14 — the largest lead of the game by either side — but Taunton clawed back into it. Sophomore Tyler Stewart came off the bench and scored four points, Law added four more, and Kenion scored his first seven points of the game, including a late three-point play to bring the Tigers within two, down 31-29 at half. Martins sank two free throws to open the second half to tie the game but the Hornets grabbed momentum back with a 10-3 spurt. Stevens converted a putback, Boen and Dooling hit consecutive threes, and Guy scored down low for a 41-34 advantage. Taunton ramped up its defensive pressure to get back into the game. Martins scored off a steal, and minutes later, Kenion and sophomore Danny MacDougall had back-to-back takeaways that led to layups to tie it at 46-46 with 2:34 left in the third quarter. “They were a lot more disciplined. Sometimes you can get them on back cuts or dribble handoff action, and we didn’t get any of those,” Vaughan said of Taunton’s defense. “We really had to score the old fashion way and gut through some possessions. Even on offense too, this was probably the most disciplined Taunton team I’ve seen on both ends of the floor, they really bought in to what [Coach Dacey] was selling. It made it brutal. When guys do that, you can’t go on runs, you can’t create separation, it makes it tough. For Taunton (15-9), it was an end to a playoff run that saw upsets over league rival Attleboro and former league rival Bridgewater-Raynham. “We discovered something, I don’t know exactly what it was,” Dacey said. “We work, work, work a lot on defense in practice. It clicked against Attleboro, then again against B-R, it’s something we’ve been looking for all year long. Mansfield boys basketball returns to Taunton High on Friday to take on #5 Newton North (20-5). Newton North defeated the Hornets in the regular season on February 10th. The D1 South Final is set to tipoff at 7:30. TAUNTON, Mass. – When Taunton senior guard John Martins needed his teammates to pick him up, they were there. And in the most crucial time of the game, when his teammates needed him, Martin delivered. 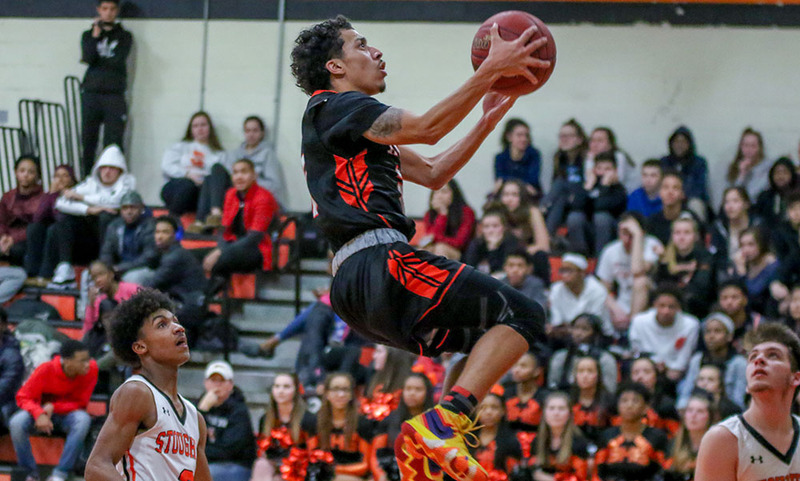 The senior scored five of his nine points, and five of the Tigers’ nine points in overtime, including three clutch free throws inside the 30 seconds to help 14th-seeded Taunton earn a 62-57 win over rival and 11th-seed Bridgewater-Raynham. “I had a rough night, I couldn’t really find a rhythm,” Martins said. “But the guys stuck with me, they kept fighting, and they kept pushing and motivating me. I couldn’t find a better group of guys to go out here with. The two rivals went head-to-head for the first time since 2012 when they were both apart of the Old Colony League. Taunton joined the Hockomock League in the fall of 2012, and the two schools had only played once — softball in 2013 — since then, but the rivalry picked up where it left off. “It’s about survival at this time of year,” said longtime Taunton head coach Charlie Dacey, who went head-to-head with former player and assistant Doug Alves, the coach of the Trojans, for the first time. “It’s not going to be pretty at times but it’s about who comes out on top. Taunton had a chance to pull away when it pushed the lead to nine, 44-35, early in the fourth quarter but the Trojans hung around. The lead was 47-40 with five minutes to play but an 8-2 burst from the Trojans made it a one-point game with just under three minutes left. Junior Dante Law (14 points, four rebounds, four assists), who missed nearly the entire first half with an ankle injury suffered with five minutes left in the first half, converted a pull up to put Taunton ahead 51-48. A free throw and then a putback from B-R’s Ryan Rubenskas tied the game with a minute to go. 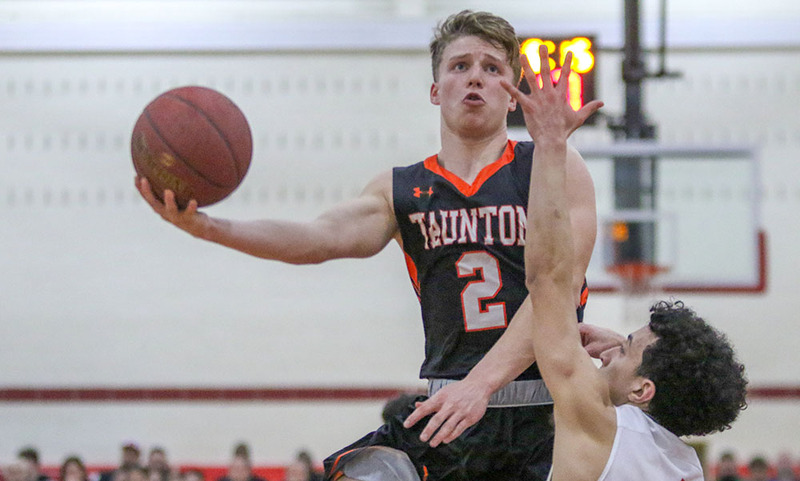 Martins hit two free throws to put Taunton up and the Tigers got the initial stop on defense, but an offensive rebound and score from Karl Aikiens knotted the score. Taunton was whistled for a carry on the ensuing trip up the court, giving B-R a chance to win it with 12 seconds to go. But Law provided good defense and B-R’s Jack Armstrong slipped and had to force a contested three that was off the mark, and the putback from Connor Rubenskas was after the buzzer, sending the game to overtime. Taunton scored on the opening possession of the extra period, and never trialed. Mike Quinn (13 points, five rebounds) found Naz Kenion (nine points) cutting to the basket for two. The Trojans tied it, but Kenion found Law in the post and his turnaround baseline jumper put the Tigers back up, 57-55 with under two minutes to play. 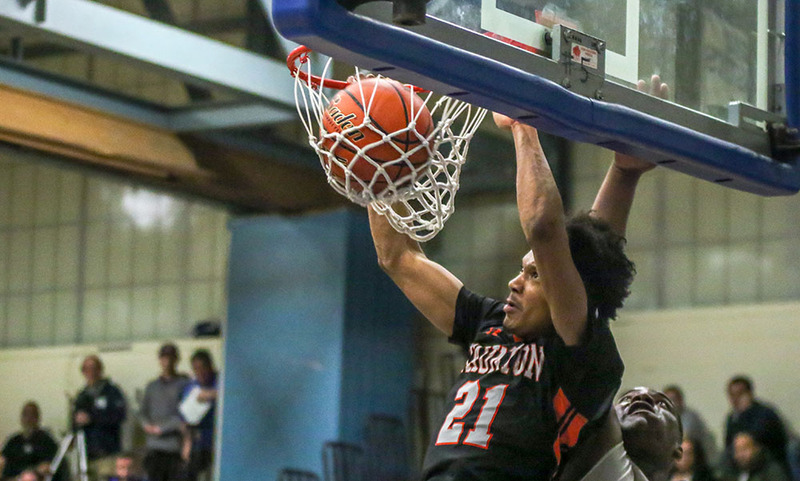 The Tigers forced a turnover and capitalized, as Martins sank a 10-foot pull up in the paint to make it 59-55, a lead that was as important mentally as on the scoreboard for Taunton. “Going up can just physiologically deflate a team,” Dacey said. “Now they’re going against the clock and they’re behind so it was big for us to go up early. And then if I could hand pick one guy to go to the foul line, it’s John, and fortunately, that’s who ended up there. B-R missed a three giving the Tigers a chance to extend the lead but a corner three rimmed out. The Trojans missed on three chances up the court next time, the last a blocked three by Quinn and Taunton took possession back. Taunton beat the press, but Jadyn Rosario (18 points) came from behind to steal the ball and then sank two free throws to make it 59-57. Martins was fouled and went to the line and calmly sank both chances, making it a two possession game with 28 seconds left. B-R was off again on another three and Martins connected on another free throw in the final seconds to secure the win. While it was a bright finish for the Tigers, it was quite the opposite to start the game. Not only was Taunton limited to just one field goal in the first quarter (1-for-11 shooting), Law went down with an ankle injury with five minutes left and did not return for the rest of the second half. Trailing 9-3 to start the second quarter, the Tigers turned to Quinn, and the senior captain gave his team life. Quinn buried a three off an offensive rebound from Wesner Charles (nine points, 13 rebounds) and classmate Lou Vendrell followed with a steal and assist to Charles for two to get within one. Quinn went on to add eight more points in the quarter, including two three-pointers, sophomore Josh Lopes came off the bench and hit a pair of shots, including a putback on an offensive rebound, and Charles scored off a feed from Martin to give Taunton a 22-21 lead at half. Law did return to begin the second half, making his presence known with a big block a minute in. Six Tigers scored in the third quarter, with Danny MacDougall, Quinn, and Martins each scoring two and Kenion dropping seven of his nine points. Kenion converted a three-point play and Law followed with a three-pointer to make it 38-32. B-R got within three but once again Law drained a triple and Vendrell scored on a fast break to give Taunton a 43-35 lead heading into the fourth. Taunton boys basketball (15-8) will face off with another familiar foe in the D1 South Semifinal as they will host league rival #2 Mansfield (21-4) on Sunday at 4:00. Taunton was a predetermined site for the D1 South semifinal before the tournament started. STOUGHTON, Mass. – A shorthanded Taunton team has seen a pair of seniors step up over the past two games. Tuesday night on the road against Stoughton, they had a third senior rise to the occasion. Following in the footsteps of John Martins (30 points against Canton) and Ryan Sullivan (27 points against Mansfield), senior Lou Vendrell came off the bench to provide a big spark for the Tigers, leading Taunton to a 70-61 win on the road. Vendrell scored a season-high 20 points, including 11 points in the fourth quarter, to help the Tigers secure an important win as they inch closer to a postseason berth. Without three starters, the Tigers posted a 1-1 record last week so Tuesday’s road trip to Stoughton was an important one. Martins had another solid effort for the Tigers, dropping 15 points and hauling in eight rebounds while sophomore Josh Lopes came off the bench and scored 10 of his 14 points in the second half. Taunton built a 10-point lead by using a 13-4 run over the final 2:15 of the first half. In the second half, Stoughton continued to push back into the game but the Tigers never surrendered the lead. The Black Knights kept the visitors scoreless for the first 4:13 of the third quarter but could only muster six points of their own. Martins scored off a turnover and assist from Vendrell to get Taunton on the board, up 37-31. A three from Lopes extended that advantage to 40-31 with three minutes left in the third. But Stoughton continued to chip away. Four points from Obinna Ugwuakazi (21 points, 11 rebounds) and two from Tahkwan Gates Brown (six points, five assists) got the Black Knights within five but a three-point play from Lopes kept Taunton ahead, 43-47, going into the final quarter. Taunton’s lead ballooned to 12 when sophomore Tyler Stewart come up with a steal then found Vendrell on the break early in the fourth quarter. Vendrell returned the favor to Stewart for two and a 51-40 lead, and then Stewart found Quinn in the corner for a three and Vendrell converted on a breakaway to make it 56-42 with 4:38 to play. The 14-point lead was far from safe, however, as Ugwuakazi converted down low, Kevin Dixon splashed in a triple, and sophomore Jake Queeney came off the bench to drain a three to make it 58-50 with 2:14 to play. A free throw from Ugwuakazi cut the deficit to seven, but Vendrell responded with a jumper in the paint to put the Tigers up 60-51. Ugwuakazi and Quinn traded two points apiece and Queeney hit another triple to get Stoughton within six, 62-56, with 1:29 to go. Each team had an empty trip, and Lopes raced out for a layup and a 64-56 lead. With under a minute to go, the Black Knights were forced to foul and Taunton was able to hold on for the win. In the first half, Stoughton junior Myles Grigalunas-Powell (13 points, five rebounds, four assists) helped the Black Knights jump ahead 12-8, but Taunton closed the opening quarter with a 6-0 run (two each from Krishon Nairne, Martins, and Vendrell) for a 14-12 lead. In the second quarter, Martins took control of the offense and scored eight points in the quarter. A three-pointer from Ajahn Rue brought Stoughton within one at 22-21 with under three minutes to go but the Tigers finished the quarter strong with a 13-4 run. Martins made back-to-back triples, Vendrell added in five straight, and Martins converted shortly before the buzzer for a 35-25 lead at the break. Taunton boys basketball (7-4 Hockomock, 10-5) begins a three-game home stand when it welcomes Oliver Ames on Friday night. Stoughton (4-7, 7-8) has its second straight home contest when it entertains North Attleboro.